MAX riders, auto drivers, cyclists and pedestrians should plan ahead for TriMet’s Rose Quarter MAX Improvements project. The project to replace switches, realign the rails and improve the track bed will disrupt MAX service from the start of service Sunday, Aug. 21 through end of service Saturday, Sept. 3. It also will require some street, lane, sidewalk and crosswalk closures. NE 1st Avenue will close between Multnomah and Holladay streets. Because of this, autos taking the Convention Center/Moda Center exit off of I-84 must turn right, on green only. The left lane on NE 1st Avenue between Oregon and Holladay streets also will close, forcing a right turn only on green as well. The north sidewalk between NE Wheeler Avenue and 2nd Avenue will close. Crosswalks across NE Holladay Street will close on both sides of 1st Avenue and the west side of 2nd Avenue. The crosswalk on the east side of Wheeler Avenue also will close for a time. When it is closed, pedestrians will have access to a temporary crosswalk on the west side of Wheeler. Pedestrians and cyclists should use extreme caution when traveling in the area. These closures begin Saturday, Aug.20, the day before the MAX disruption begins, and may run through Wednesday, Sept. 7. Shuttle bus operations will require two lane closures in the Rose Quarter and Lloyd Center areas during the MAX disruption. The northbound right lane on North Interstate Avenue between Drexler Drive and Multnomah Street will close to autos. The lane closure allows shuttle buses to stop against the curb and cyclists to pass on the left of buses. Flaggers and TriMet staff will be on site to ensure safe movement of buses and bikes. Buses operators, cyclists and TriMet riders should use extreme caution in the area. Near the Lloyd Center MAX Station, NE Holladay Street between 11th and 13th avenues will be closed to autos and cyclists. Shuttle buses will use this section of Holladay to pick up and drop off MAX riders. These closures begin Sunday, Aug. 21 and run through Saturday, Sept. 3. The Rose Quarter MAX Improvements will alter MAX service from the start of service Sunday, Aug. 21 through the end of service Saturday, Sept. 3 and riders should plan extra time for their trips during this time. MAX Blue, Green and Red lines will be disrupted and all MAX lines will have reduced frequency. Trains will run on special schedules and space on board will be extremely limited during commuting hours. You may not be able to board the first train that arrives, especially on the west side between Hillsboro and Beaverton where capacity will be reduced by more than 50 percent and trains are already often full during rush hours. 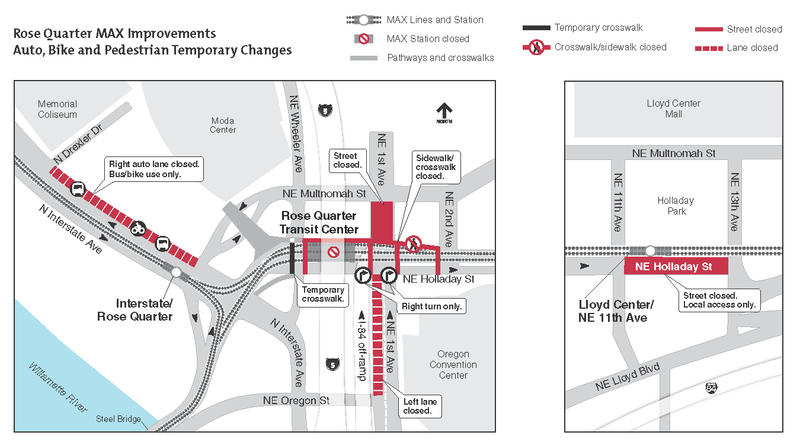 Three MAX stations will be closed: Rose Quarter, Convention Center and NE 7th Ave. Shuttle buses will run between the Interstate/Rose Quarter and Lloyd Center/NE 11th Ave stations, and serve stops near closed stations. Shuttle buses will also provide direct service between Portland International Airport and Kenton/N Denver Ave Station, which will be served by MAX Red Line. Plan at least an extra 30 to 45 minutes for trips. Consider altering trips to travel outside of rush hours, take TriMet’s regular bus service or the Portland Streetcar, telecommute, carpool, bike or use other transportation during the two-week project. This may be the time to try Portland’s new bike-sharing program BIKETOWN. With room onboard MAX very limited, to prevent extended delays cyclists should bike the entire way, park your bike at a station or leave your bike at home during the disruption. Plan your trips ahead of time at trimet.org. Our online Trip Planner reflects the adjusted service schedules during the project. You can also view the special schedules, get line-by-line details and view animated maps at trimet.org/rosequarter. You can also call our customer service staff at 503-238-RIDE (7433). During the Rose Quarter MAX Improvements, crews will replace switches and improve the track bed east of the Rose Quarter. The rails into the old trolley barn next to the MAX station will be removed. Crews will re-align the track and reduce the curve into the northern platform, which will create a smoother ride. Crews also will upgrade the 30-year old signal system servicing the transit center, which will increase MAX reliability and help us keep trains running on time. 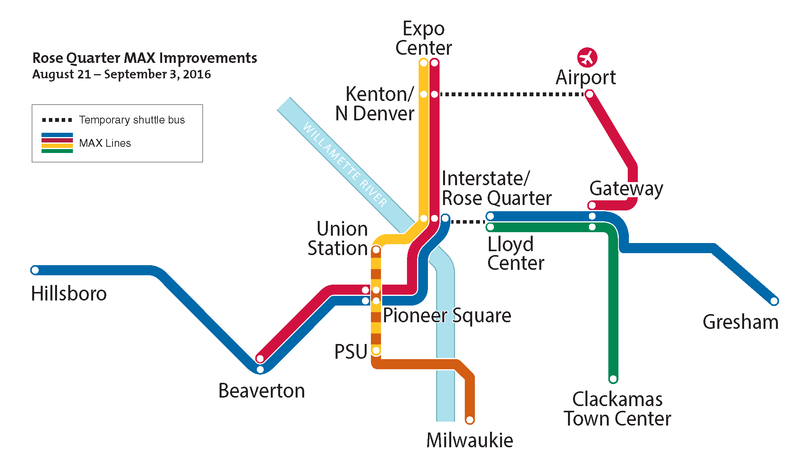 The Rose Quarter MAX Improvements are just part of TriMet’s efforts for Making Transit Better. Learn more at trimet.org/bettertransit.